Boy, what did I let myself in for with this competition? There are some stunning boat pictures on the Skipr system. Here is something to add to your boat’s bookshelf, the Coastal Cruising Companion. And before you ask, no it has no direct connection with the ‘CCCA’. The author, Marilyn Graham, cleverly calls it a Cruising Companion, to differentiate it from cruising guides like the iconic Alan Lucas cruising guides. Cruising Guides are tricky, we expect them to be accurate, complete and compatible with our own level of experience. Marilyn Graham has taken the bit between her teeth and has written her Cruising Companion from the perspective of a novice cruiser. In doing that, she has produced a terrific guide, worth having on any boat, novice or experienced. I started a listing of magazines including their online companion sites which might be of interest to Australian Cruising Sailors. Please have a look and comment on what you think and if you’d like to add any other magazine to the list. A few friends have asked about the Wireless Broadband Internet and phone setup aboard Te Moana. Last year, we fitted an Ericsson W25 on our boat. Previously, we had USB modems (Maxon CDMA and later the Maxon Turbo modem) with Telstra mobile data plans. Today I still use the (orange) Maxon Modem while we’re ashore (handy in the train or at a customer). But while on the boat I take the SIM card out of the modem and plug it into the Ericsson W25 which Andersen Marine installed on Te Moana last year. Panbo, “the Marine Electronics Weblog” (an excellent source of marine geek news) just published a survey of current iPhone apps which extends the functionality of an iPhone on board even more. But wait….can you get Australian mapping for all these nifty chart plotting apps? Not likely. You see, there is no copyright on US charts, as the US statutes prevent their Government claiming copyright on works which were created by Government employees. That’s why software makers can include (raster) charts at no charge. I think you could make a good case for abolishing copyright on Australian Hydrographic charts. Having free raster charts available would encourage more boaters to have up to date charts and encourage the use of low end systems such as those in the survey above as standby systems and on small craft. How about it, Kevin? And Caroline, next time you talk to Mike Prince at the Australian Hydrographic Office, ask them why they don’t freely license Australian charts which we, in effect, have already paid for through our taxes. The best option I have found to dispose of flares is as part of a safety-at-sea course or exercise which are regularly held by sailing clubs like the RPAYC. It gets you experience in activating them, as well as giving an opportunity to dispose of unwanted flares. By the way, great magazine, Afloat. Great price, Good value. Did you know that you can read it online? You can safely subscribe to their email – no spam – just a monthly email with a list of articles – recommended. The following is a description of the fitting of an Automatic Identification System (AIS) Transponder to SV Crystal Blues by Neil and Ley Langford. It originally appeared on their web site. 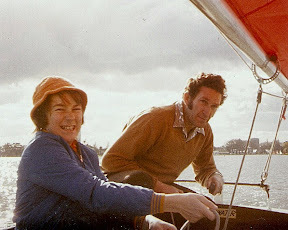 My father taught me to sail when I was about 8 years old – he’s the worried one in the old photo at right (probably because my brother Peter is on mainsheet). With great and delightful understatement, he always said that “a collision at sea can ruin your whole day”. He’s absolutely right of course, though nowadays we can use AIS technology to help avoid those “ruined days”. This is the first of three posts regarding the system, and basically describes the technology. Future posts will cover our installation experiences and the system in operation. Some years ago the International Maritime Organisation (IMO) ratified a standard requiring all ships over 300 tons to carry an Automatic Identification System (AIS) transponder. This was a major step forward in collision avoidance for ships at sea. The system really works – AIS equipped ships constantly transmit information including name, MMSI number, position, speed, course, rate of turn, cargo carried etc etc. Commercial vessels within range receive that data, which is then displayed on dedicated screens or (in most cases) overlaid onto radar or chart plotting screens. 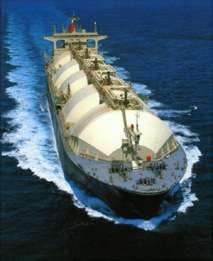 The result is that AIS equipped vessels are readily identified, tracked and avoided. This is a significant primary safety system, and many in the yachting community have taken advantage by purchasing low cost AIS receivers – these display ship locations on navigation chart plotters, or on suitably equiped navigation computers. Whilst an AIS receiver system is a good thing to have, I always believed that the best safety system required the big ships to see me as well – I wanted a transponder that would transmit and receive. At first glance, the recently launched iPhone is ideal for use on a coastal cruise. It isn’t just a phone with a built in iPod. It has a GPS built in, its web browser is superior to any other mobile phone browser and well suited for small data entry tasks such as using the skipr.net “Where is my boat” site. On the surface a great phone for marine use! On my recent sail North on Breakaway, the iPhone hadn’t been released, but I did have a “Touch iPod”, which has many of the iPhone capabilities. Breakaway had WiFi Internet access through the Ericsson W25, so I used the iPod to great effect to keep up with my emails and also used its mini browser for log entries to the Skipr system. For much of the time I didn’t need my computer because the iPod had all the Internet access I needed. When I needed a larger screen or more extensive text entries, my laptop could also conveniently connect to the system. So how about using an iPhone to do everything?